Not wishing to vandalise the lines of my Bianchi Sempre Pro with a black (and probably unshapely) tool bag threw up quite a few a questions a month or so back. 1 – Firstly how much to carry – Aside from my phone and an emergency gel (that I have yet to resort to – but I do have a habit of getting lost and finding a long route home), I’ve pretty much sorted my clothes, so what I go out in is noramally all I need and I’m no longer trying to cover other eventualties. The bike is always well maintained as well, which in turn means that I can carry a fairly minimal toolkit. 2 – So, what tools to carry – I always carry a spare inner tube, some sticky patches (for the second and third punctures), tyre levers (two for those days when the tyre just won’t budge off the rim) and a pump. I always carry a mini-tool, and have just shifted from a ‘big’ multitool to a paired-down Crank Brother m5. My only two ‘luxuries’ for unusual breakages are a spare Sram chain link and some zip ties, which weigh nothing. 3 – Where to carry – The mini pump fits neatly in a rear pocket, and I could get the rest of the tools into a pocket as well, but it starts to feel a bit crowded. And on those days when I want to pack a bit of maltloaf (my go-to fuel for longer rides) or a winter hat in months to come, it’s going to feel distinctly stretched. So I’ve opted to keep those tools in a saddle pack… which brings me back to aesthetic. 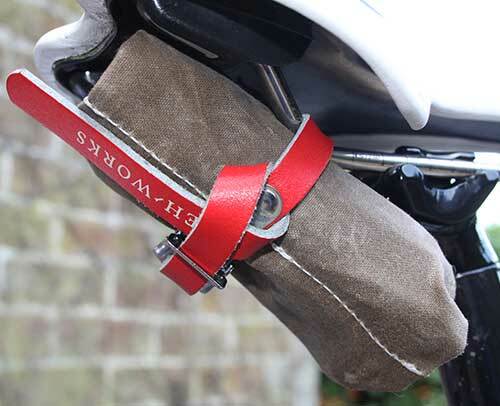 In many ways this was an easy decision – for years cyclists have rolled their tools into a rag and tied it under the saddle with an old toe-strap – it’s a systems that worked perfectly and allowed the rider to expand or shrink the ‘pack’ to suit. Maybe it was the shift to clipless pedals, and the absence of ‘old’ straps, or may the general move to more ‘engineered’ solutions that saw the end of the old tool roll. 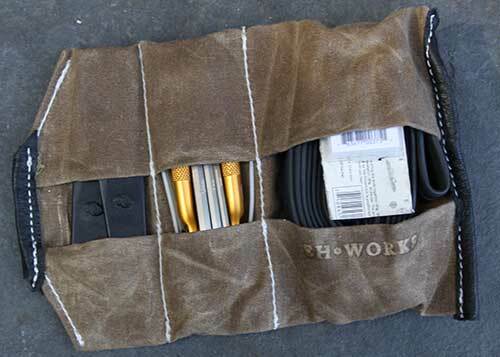 Fortunately there are companies out that still make tool rolls, such as Brookes in the UK (although theirs is very expensive) and E H Works in Seattle. So I’ve gone with the latter… they were marketing their tool roll as the Mopha roll, but it would seem that since I ordered mine they’ve dropped the Mopha name. Anyway, despite that initial trepidation that questioned whther a leather strap (rather than some sophisticated clip system) was man-enough to hold my tools in place, and expectations of finding them missing when a puncture occurred, I’ve now got a couple of 100km under my belt and the E H Works roll is absolutely fine. The tool roll that you can see here is their Sojourner roll – it seems suprisingly small when you first see it (it arrives beautifully wrapped in E H Works brown paper), but as you can see it is big enough to fit the tube, tyre levers, mini tool, zip ties patches and spare chain link. I can also vouch for it’s ease of access when on a ride, having had a major puncture at the weekend that was close to requiring a new tyre – a Swiss Army knife might actually have been handy to create a proper patch for the tyre itself (it was a big hole), but it held until I got home, and was an unusual puncture. Previous PostKeep Calm And Peloton shirts on sale now! Next PostCrank Brothers m5 – Perfect road bike mini tool?